The Monster XL is my favorite soaker. It's one of those soakers which is either really liked, or really disliked. It's rarely a middle thing. Many don't like it for its size, weight and amount of pumps. For people who like to run and move around, the MXL will be difficult to use. However, this positive review is meant for people who have no problems with carrying 20 pounds and doing alot of pumping. As already mentioned, its drawbacks is the weight, especially the balance, since the front part is much heavier than the back part. The balance is better once it's filled with water. Also, with the strap you can let it simply hang from your shoulders and shoot from the hip, which does not require much lifting. There might be alot of pumping, but the MXL has an easier pump than the CPS 2100. With the quick fill ability speeds up battle recovery once you run out water. The support legs seem medium build, but the rest of this soaker is build extremely well. The many nozzle sizes give enough choices for conserving water. Also, the size of the MXL makes it usable as a shield. The main strengths of the Monster XL are the long shot time and incredible soakage. The single nozzle 5X has 14 seconds shot time, 10 seconds of longer shot time than the CPS 1500. The dual nozzle 11.5X has a shot time of 4 seconds. So a clear 23X shot for 4 seconds can go head on with any 20X soaker out there. The MXL might be underpowered for its size, but not underpowered in general. It outpowers the CPS 1000 and CPS 1500. I have to mention, that this review is about the 2002 model, which is shorter than the 2000-01 model. Also, according to other MXL reviews and stats, the 2002 model is more powerful and has longer shot times than the 2000-01 model. As a sidearm I suggest big CPS weapons with straps like the CPS 1500 and the Monster X. That is if you can carry both. You might as well don't worry about mobility anymore once you use the MXL. So another huge CPS weapon will not make much of a difference. Also a seconds big CPS weapons will prevent people from gaining up on you. I use 2 Monster XL soakers for every mission, and the 46X soakage is always useful. 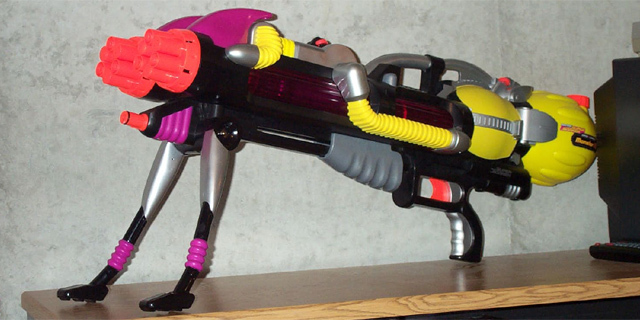 If you are a heavy gunner, or someone who likes big soakers and extreme soakage, the Monster XL is a must. They are usually sold out at the same day of shipment, so if you have the chance to buy it, do not hesitate. Properly used, the Monster XL is the ultimate weapon in a water battle. When I first layed eyes on this soaker, I thought it would be perfect. It was what we had been asking for: a soaker for the older kids. It appeared like a dream soaker. Doubled barrelled, large pressure chamber, huge reservior, and a bipod to hold it up. Boy were we wrong. The MXL is not worth the money or the hassle. It's so heavy for one thing. It takes 65 pumps to pressurize. The shot time is horrible. The water capacity is ok. I would not reccomend the MXL.